STREATOR, Ill. (Jan. 31, 2019) – Vactor Manufacturing, Inc., a subsidiary of Federal Signal Corporation and an industry-leading manufacturer of sewer and catch basin cleaners, and vacuum excavators, today announced the introduction of TRUVAC™, a brand of premium vacuum excavator trucks designed specifically to satisfy the safe-digging requirements of businesses or organizations that locate and verify underground utility lines and pipes. The TRUVAC brand will focus on vacuum excavation, while the Vactor brand will continue to focus on equipment solutions for cleaning and maintaining sewers and catch basins. TRUVAC vacuum excavators use high-pressure air or water (hydro-excavation) to loosen soil, providing a non-destructive means to safely locate, excavate and uncover underground utilities. The loosened soil is removed through a vacuum hose and deposited into a debris tank for disposal or backfilling. An expansive network of dealers has been carefully selected to sell TRUVAC machines across the United States and Canada. Additionally, a team of dedicated, experienced sales managers, product management, service/support personnel and marketing staff is concentrating on the growth, expansion and operations of the TRUVAC brand. The team is based at Vactor Manufacturing, Inc.’s headquarters and production facilities in Streator, where TRUVAC machines are built. The TRUVAC product line includes the versatile Paradigm® sub-compact vacuum excavator, the Prodigy® vacuum excavator that offers power and performance in a smaller footprint, and the HXX series of full-sized vacuum excavators designed to tackle the biggest digging projects. 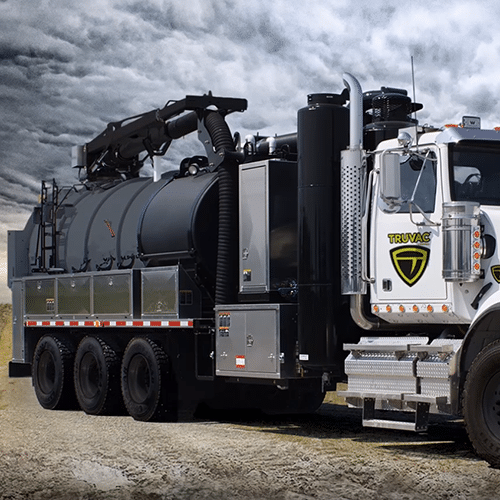 Vactor Manufacturing, Inc., manufactures the Vactor brand of sewer and catch basin cleaners, the Guzzler brand of industrial vacuum loaders, and the TRUVAC brand of vacuum excavators featuring innovative technology and custom configurable designs. Based in Streator, Ill., Vactor Manufacturing, Inc., has authorized dealers and service centers across North America. View the TRUVAC product line here.